The following is a reprint of a letter sent to clients today on Nephron’s 1st “birthday”. It was an opportunity to thank them for their early support but also to reflect on what we think differentiates our platform as we pursue a simple mission: to be essential to our clients investment process. info@nephronresearch.com for more. Today is Nephron’s first birthday (by publication date) and we wanted to mark it by thanking you for your early partnership. We also wanted to share our sense of accomplishment as well as our excitement for the coming year. One year ago, we launched an independent healthcare research product making a bet that quality and experience mattered. We pitched you on what we thought was a superior product at a fair price – and you showed up. THANK YOU! Nephron Research has the simple mission of being essential to our clients investment process. Over the past year, we learned a lot and made our share of mistakes, but believe we’ve proven ourselves to be accretive partners and that a pure research focus leads to better content. The three pillars of our product have held, and feedback has been overwhelmingly positive. Thought Leadership Matters – Because we spend 50% more time developing research than our distracted competition, we’re able to help drive the conversation on important topics rather than just report on it. We’re industry experts with deep rolodexes, called upon to chart future trends by leaders of the sectors we cover. We start with a top-down perspective, then build bottoms-up detail to develop a thesis. 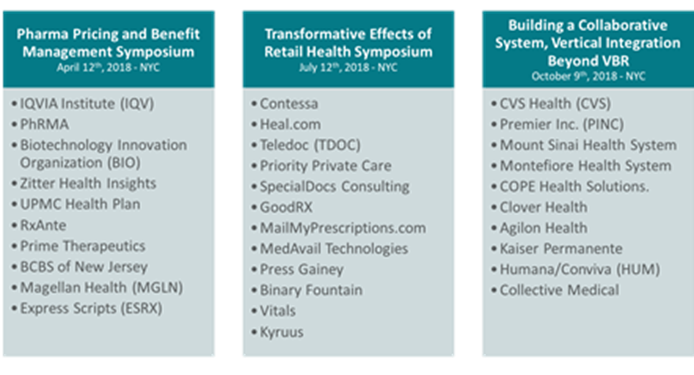 From defining “A World Without Rebates” to “The Transformative Effects of Retail Health”, we’re making the most of our networks and tenure to stay in front of trend. Deeper, Better Research Product – As traditional sellside research gets less experienced and more stretched, we’re digging in where it matters and attempting to answer the difficult questions. Our proprietary data partnerships have given us a unique perspective on branded and generic pharma pricing. With M&A dominating the landscape this year we did 34 event-oriented deep dives on specific transaction aspects. We published five major thesis reports on topics from Amazon to “Where Does the Money Go” in the supply chain. Defining “Strategic” Corporate Access – We all understand the commoditized state of traditional access. Our view was that the right level of access at the right time would make all the difference. In 2018 we delivered 11 Legends and Innovators lunches, 9 strategically timed roadshows, 5 non-traditional field trips and tours, 3 thematic panels as well as our 3 “cornerstone” symposia, summarized below. Simply put, our calendar balances access, timing, and strategic relevance better than others. So with all of that said, we hope the coming holiday season brings you and your families a chance to recharge. Again, we say thank you for your early and enthusiastic partnership. Looking forward, we’re approaching 2019 with a raft of growth plans and product improvements as well as the determination to serve you and your investment processes even better.